wooden case, which is suitable for long-distance transportation, multi-time loading & unloading for fork trucks. 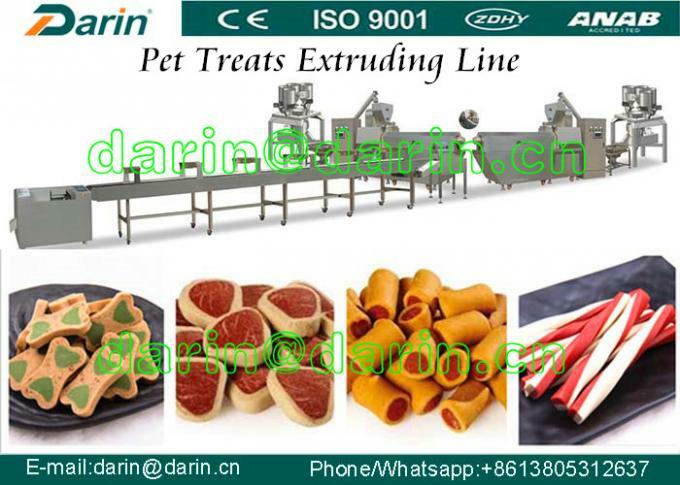 Production Line For Producing Pet Food /dog Chew Snack /pet Treats Food Machines can make dog chewing food which uses different kinds of materials with scientific configuration and extrusion in the extruder. Pet snacks can be made into a variety of shapes such as stick, bone, etc. Production Line For Producing Pet Food /dog Chew Snack /pet Treats Food Machines not only provides nutrition to dogs, like protein, fat, vitamin, etc, but also satisfies the dog nature hobby, benefits its strong teeth, cleans mouth and teeth, and prevents disease. 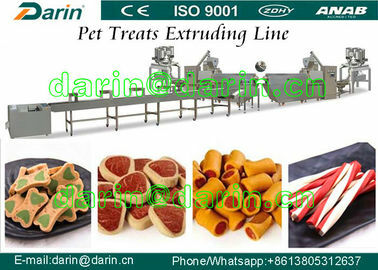 Production Line For Producing Pet Food /dog Chew Snack /pet Treats Food Machines is a new innovation of our engineers. 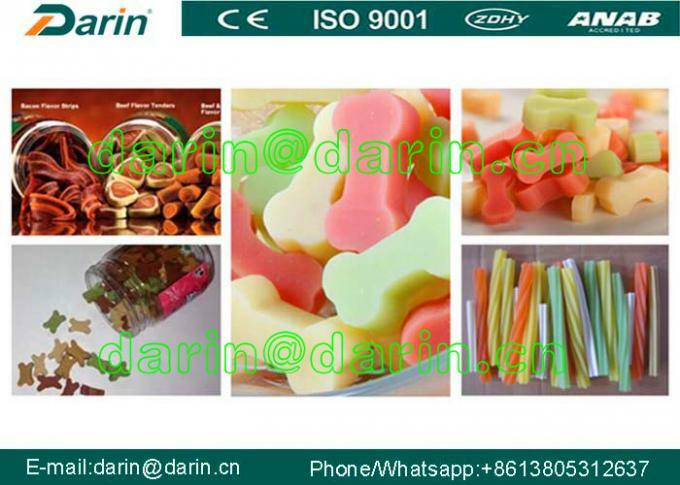 It can produce pet treats food like strip shape, stick shape, twisted stick shape, double colors and multi-colors core filled snack. Pets can absorb nutrition elements during enjoy chewing these delicious snacks. 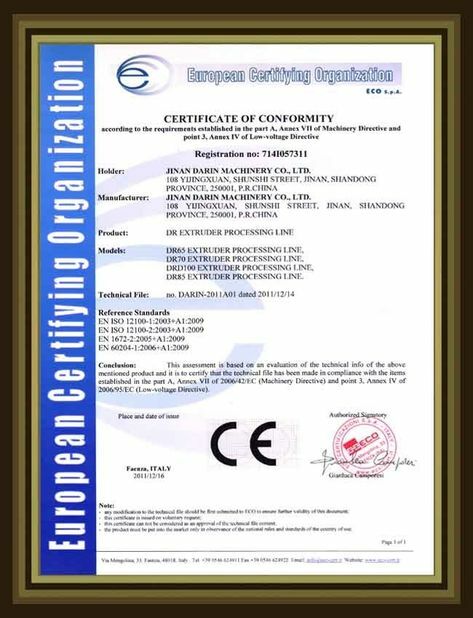 Raw materials: Pet Treats /dog Chews Food Processing Equipment adopts corn starch, potato starch, animal meat, rawhide, etc as raw materials. Products: twist, double colors, core-filling pet treats and so on. Voltage in China: Three phases: 380V/50Hz, Single phase: 220V/50Hz, we can make it according to customers’ Local voltage according to different countries. Machines materials: All the machines are made by stainless steel, dog chewing food machine is with reasonable design and with high automation; the screws are made by alloy steel, with building block system structure and self-cleaning function. 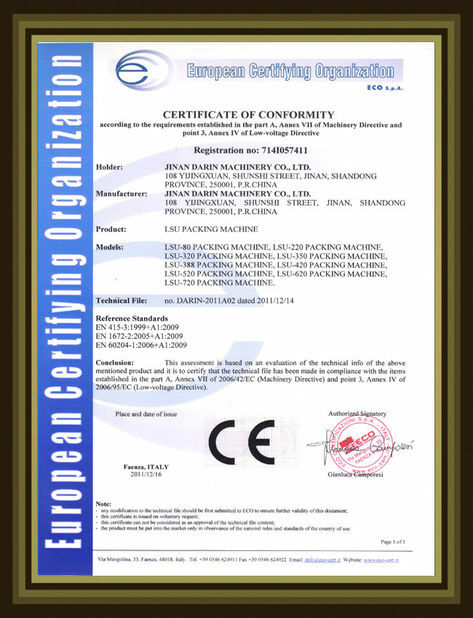 CE CERTIFICATE, ISO 9001 CERTIFICATE provided. UL Cerficate under applying. Pet Food Exturder/Pet Food Making Machine has balancing the components and gentle processing are at the center of the related quality considerations. Pet Food Exturder/Pet Food Making Machine is therefore increasingly proving to be the right tool for modern Pet food. A complete feed, fed as a diet over a prolonged period of time, must ensure the vitality of the animal and prevent deficiencies. Pet Food Exturder/Pet Food Making Machine is quite a challenge to the feed manufacturer in terms of the selection and composition of the raw materials, their optimal processing, and effective quality assurance. Pet Food Exturder/Pet Food Making Machine constitute the biggest market segment. Pet Food Exturder/Pet Food Making Machine has high-grade complete feeds capable of maintaining the health even of exotic species in aquariums over prolonged periods of time, sinking or floating feed. 7. Three kinds of protectors to keep machine and operator safe: over-heating, over-current, over voltage. Add: East 2-2 , Xinxu Industrial Park, Jinan 250032, P.R.China.